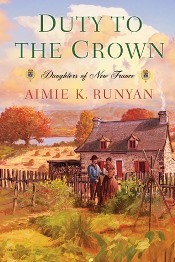 In my review of the first book in Aimie K. Runyan’s trilogy about the women of New France’s Quebec settlement in the 17th century, Promised to the Crown, I’d written that “the latter part of the book appears to head into saga territory.” This turned out to be a good prediction for the second book, Duty to the Crown. 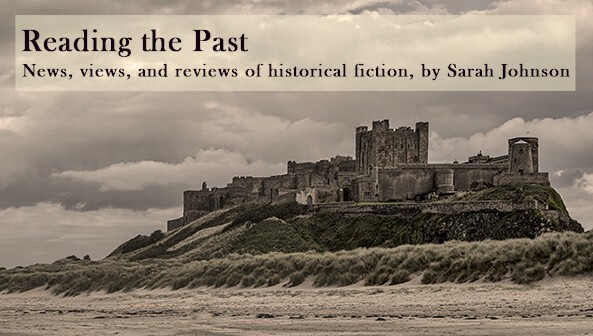 It opens in 1677, about half a generation later, and focuses on three women of very different upbringing, and who aren’t particularly close, but who are drawn together as their circumstances change. Manon Lefebvre, a young Huron woman who had been raised as a foster daughter in a well-to-do colonial household, had returned to her home village but must reinvent her life after she’s suddenly expelled from it. The painful realities of a woman’s lot in this French frontier community are exemplified through the story of Gabrielle Giroux. A talented seamstress who had escaped a rough family environment, she marries a stranger to save her guardians the large fine they’d incur if she doesn’t find a husband by age sixteen. Lastly, Claudine Deschamps, Manon’s spoiled foster sister and the younger sister of Nicole from the first book, undergoes trials that transform her character. The story excels at depicting the women’s emotional growth over the novel’s three-year span. They rely on one another for support when men or the law abandons them to their fates, which happens quite often. It’s made clear how directly their happiness, or lack thereof, is tied to the men they wed. In a close-knit community like Quebec, an unmarried woman can lose her good reputation after one thoughtless act, while a Rouen farmer’s daughter can become very wealthy and gain social status through her marriage to a local seigneur. By now, the women and their families aren’t new immigrants, but settlers who think of Quebec as their home, and their mindset reflects that. The larger political and economic events shaping French Canada aren’t as prominent as they were in the first book; the settlers’ world seems very self-contained. However, the author strikes a good balance among the lives of the colonial elite, with their richly appointed homes and gowns, and those of average settlers and the Huron peoples. This lively and entertaining saga is written with a light touch. The women’s domestic concerns are paramount, and the joys and misfortunes they experience are evoked in an affecting way. I felt personally involved in their lives and am eager to see where their families’ stories lead from here. Duty to the Crown was published by Kensington in November.